I would like to tell you about my wood and fires. Over the last month, wood has been my life. I wake up thinking about wood after sleeping and dreaming about wood; day after day up to my chimney flue in wood. I just unloaded another trailer full of wood yesterday as a matter of fact. Wood. I’m living in The Milkweed Mercantile this winter which is the lap of ecovillage luxury with my king bed, private shower, and lending library. The Mercantile is heated with, you guessed it, wood, and I’m in charge of keeping the fires burning. I said fires, plural. The outdoor Heatmor boiler heats water up to 160 degrees which circulates thru the floor in part of the downstairs. This ultra-hot water heats up the huge thermal mass sink that is the thick, concrete floor, so the heat can slowly and steadily warm up the air in the building. The Heatmor boiler is also used to heat the hot water for the kitchen and bathrooms. I’ve gone a little shower crazy since I moved over here averaging two showers a week instead of just the one. Such is the relativity of craziness in an ecovillage versus The World Out There. At the risk of jeopardizing my welcome here at The Mercantile, I’ll admit that I leave the shower running here while I lather up. I know, crazy again. This decadent shower routine is in contrast to my Common House shower routine where I showered this summer wherein I would 1) get wet 2) turn off the water and lather up with diluted soap 3) turn the water on and rinse off real fast. Wood. I didn’t smell like smoke this summer though, but I do now. In addition to loading about 32 pieces of wood into the Heatmor every day, I also tend the fire in the dining room here at The Mercantile. I get it going about 7:30 am. I put the last log on about 5 or 6 or 8pm. My mentor and fellow fire whisperer Kurt showed me how to roll a piece of newspaper and fold it in such a way that it has less a tendency to roll off the top of the fire I’m trying to start. The name of this newspaper kindling in the jargon of firestarting origami is The Rabbit. One full sheet of newspaper is rolled loosely and coaxed into the simplest of knots like the knot you began with as you tied your shoes this morning and voila - The Rabbit. Are you paying attention? Yes I said, “...roll off the top of the fire.” More ecovillage craziness. Kurt the Fire Whispererer taught me how to build a fire TOP DOWN. It’s called a Top Down Fire. True story. A neighbor with a Master’s Degree in Thermodynamics, true story, passed the technique along to Kurt the Fire Whisperererer who has made a believer out of me. The Rabbit is placed on The Log Cabin and burns down from top to bottom. 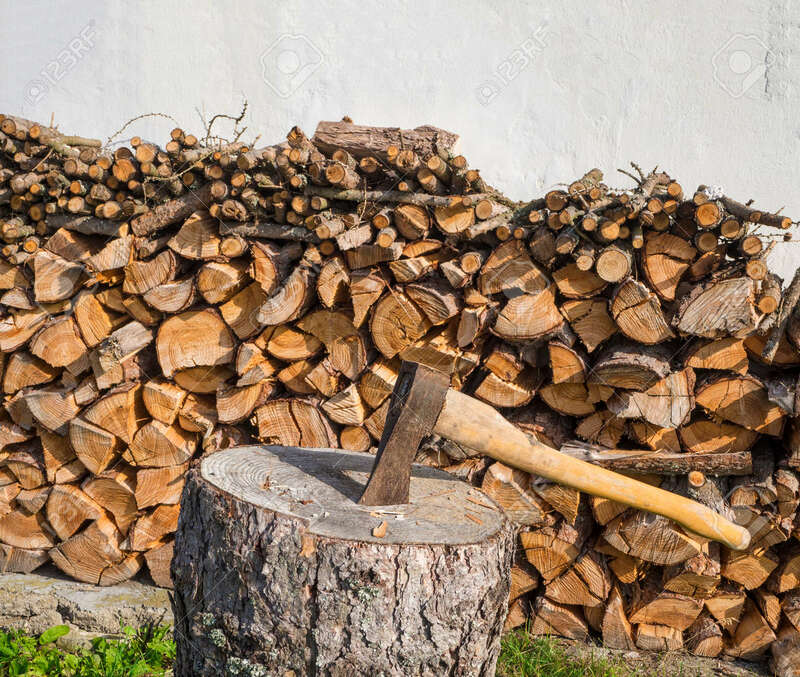 The secret is to begin with fairly small kindling at the top and work up, I mean down, in 3, but 4 is better, levels on top of the first actual logs. Top, bottom, I don’t even know what I’m talking about at this point. Wood. All I know is the technique works, and I’ve only had to do a second Rabbit atop the Top Down Fire on two occasions over the last 30 days. That is a pretty good track record. Kurt the Fire Whisperererer also taught me how to safely make kindling. “The trick,” he said,”is to not hit yourself with the hatchet.” Sage words indeed my friend. Sage words indeed. And another safety trick I learned sort of on my own. Do not put ashes in a plastic, 5 gallon bucket even if the ashes have been sitting overnight. But why dwell on that? My third firekeeping duty is to fire the boiler in the Skyhouse. The boiler in the Skyhouse is a Tarm 9000XL made in Scandinavia where they know well of such things as fires and scalding water in order not to freeze. I’ve started about 10 fires in the Tarm 9000XL and read the manual twice. On my second reading, I put little green dots next to the things I thought most instructive and important in the manual. Yes, I just admitted in public to highlighting a boiler manual. Susan is complicated though, trust me. My co-firing friend calls the Skyhouse Tarm “Susan” so now I do too. Susan is the most complicated of the fires I start. For example, The Heatmor at The Mercantile has an ON/OFF switch for the fan. It also has a zig zaggy latch. The Mercantile fireplace has a damper to set the airflow and a little latch on the doors to prevent wood from running away when nobody is looking. Somebody is usually looking though because my fires are gorgeous as I often mention. Did I mention how gorgeous my fires are? Wood. Susan The Tarm has two doors, a fan, a fuse, a pressure gauge and a temperature gauge, a spring-loaded locky thingy and a flux capacitor. It really doesn’t have a flux capacitor, but if you’re around my age or have way too much free time you know what I’m talking about. The wood for Susan The Tarm can come from almost anywhere. Some of it is piled inside the Skyhouse in the storage area which keeps it dry but getting in the storage area can be a bit hazardous. Some of the wood is on the front porch in boxes which can be brought in but only after taking off my shoes because the Skyhouse has a No Outdoor Shoes Inside Policy which might be a result of not having an actual floor in about half of it. The half that does have a floor, by the way, is heated up in order to slowly release it’s heat just like in The Mercantile. But I digress. Some of the Skyhouse wood also comes straight from the pile outside which is sort of under a tarp to keep it dry but sort of not but there is a ladder there laid across the top of the pile in case…, in case, in case someone wants to climb across the top of the wood pile… on a ladder. I don’t know. It’s a crazy ecovillage thing and nobody has frozen to death yet but it’s barely November so I’ll keep you posted if I don’t immolate myself firing up Susan. OMG! You are a funny writer. You should come to writers group on Wednesday mornings. Great stories, fire keeper. Heated floors sound great! I can relate to these wood stories, yours are way better than mine. Heated floors sound really great. Once again, a great story filled with lots of smile making words. AND, I know exactly what you mean when you mention a flux capacitor. You sure seem to enjoy the wood work! They say wood heats you twice. Once when felling, hauling, cutting and splitting; and once in the fire. Three times for you though, because you get to count once in the shower too. But could be six times, if you individually count the felling, hauling, cutting and splitting because you do them separately.